The Class of 1976's next major reunion - 45 years - will be in 2021. Contact: Annie Foral Dibelka at adibelka@hotmail.com. Details: Fundraiser for the South High Arts addition: silent auction or donations. Food and drink available for purchase. Please RSVP to Margo Juarez. 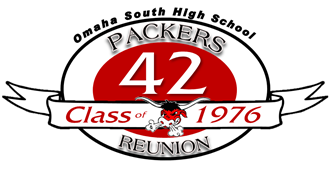 Details: South High Class of 1976 will be celebrating their 40th class reunion on Saturday, July 30th. The reunion will be held at the Knight's of Columbus Hall (4323 Washington St, Omaha, NE 68107). **We are opening our reunion up to the 75 - 77 classes. Contact person: Annie Foral Dibelka at adibelka@hotmail.com. For further information and updates, find us on Facebook: Omaha South High Class of 1976.